REVIEW | Will this new pilgrimage take the series to the promised land? I come into Far Cry 5 with a bit of skepticism. I've somewhat enjoyed the series, but I've only beaten Far Cry 3 and Primal. The rest I've tasted: played for a while, but never really committed to. I'm not fully onboard this franchise. So I'm shocked to say I enjoyed my time with Far Cry 5 from intriguing start to insane finish. The overall feel of Far Cry 5 remains the same as previous games in the series. It's still an first-person open-world action game where players have to shoot, drive, hunt, and stealth kill their way to success. If you've played a Far Cry game since Far Cry 3, jumping into Far Cry 5 should be easy. 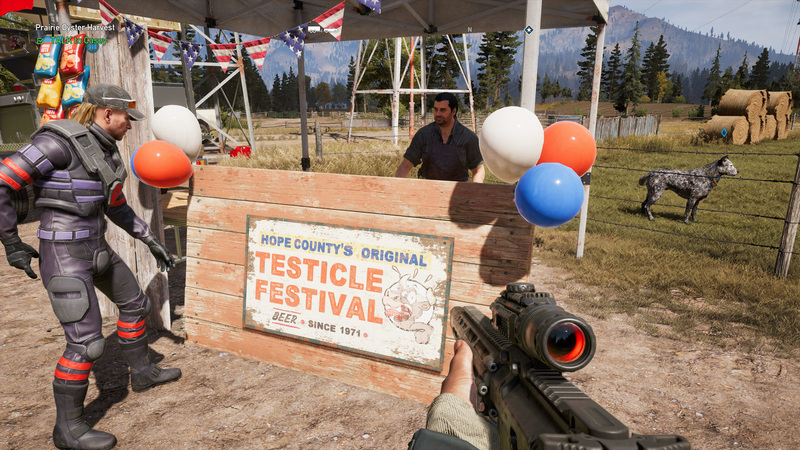 Far Cry 5 in one perfect image. Now that we've taken back this region, shouldn't you guys... take down that body? The Far Cry series has always operated as a fictional travelogue to an "exotic" region. Far Cry 3 took place in the Rook Islands, a fictional pair of islands somewhere between the Indian and Pacific Oceans. Far Cry 4 traded the sea for the mountain peaks of Kyrat, a fake region in the Himalayas. 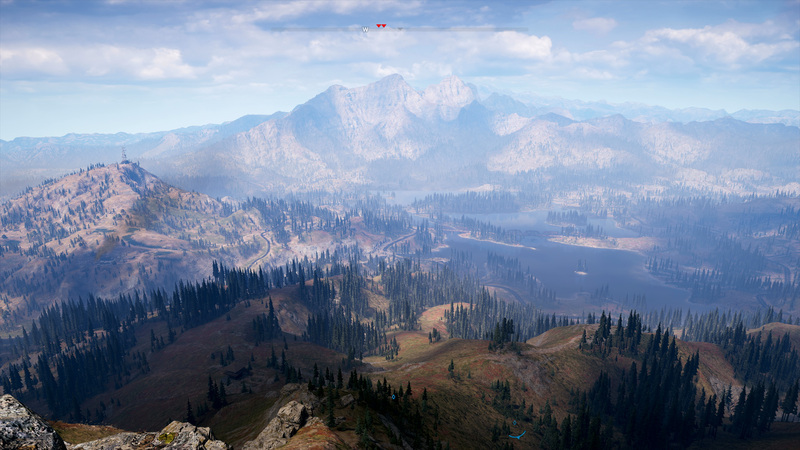 Far Cry 5 takes the franchise to the fictional region of Hope County, Montana, which feels decidedly less interesting until you really get in there and start wandering around. Ubisoft has made a few changes to encourage that wandering. 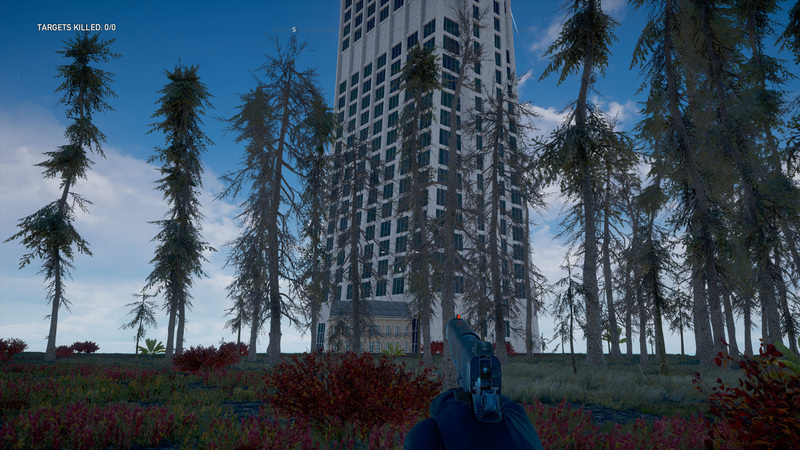 Gone are the infamous "Ubisoft Towers" that featured in many of their open-world adventures; one character even jokes early on "I'm not going to have you climbing towers." Instead, you find new locations by getting there in-person, having a mission send you in that direction, or finding a bit of intel from a discarded note or local townsperson. The mini-map is gone, replaced with a Skyrim-style compass at the top of your screen. 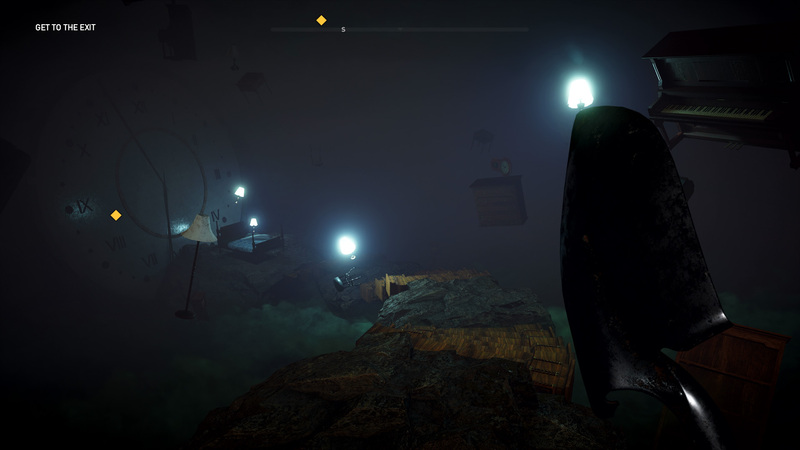 There are still a few waypoints on the map, letting you know that something worthwhile is in the unexplored darkness of the map, but there's also a ton out there that requires you to actually hoof it out there to find something. Having finished the game, I still haven't found a few cult structures and I assume they're in the big parts of the map I haven't charted yet. The sniper, Grace, sets up for a raid. 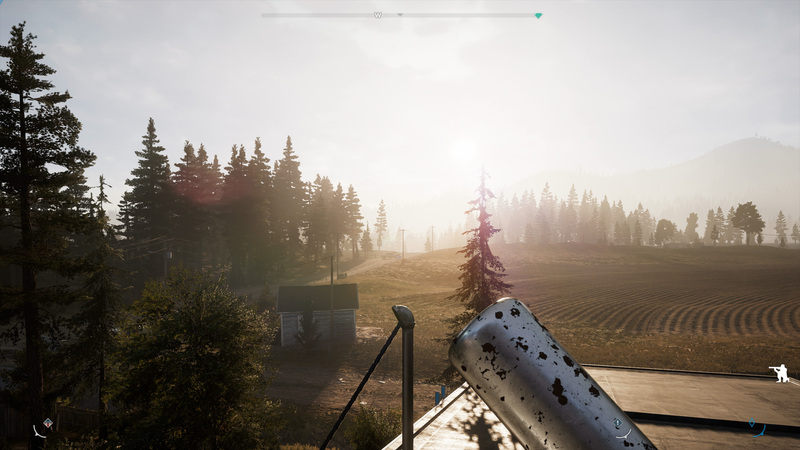 I played primarily on PlayStation 4 Pro and found some of the vistas stunning to look it; this is a damned beautiful game and as a person who firmly lives in suburban and metropolitan areas, I'll take this glimpse into the wide open spaces of the US. The PS4 Pro sounded like a jet engine at times, but performance was pretty solid for a game that throws as much at you as it does. I wouldn't say it's a locked 30 fps, but it didn't hitch too hard for me. Sorry. Didn't see you there. 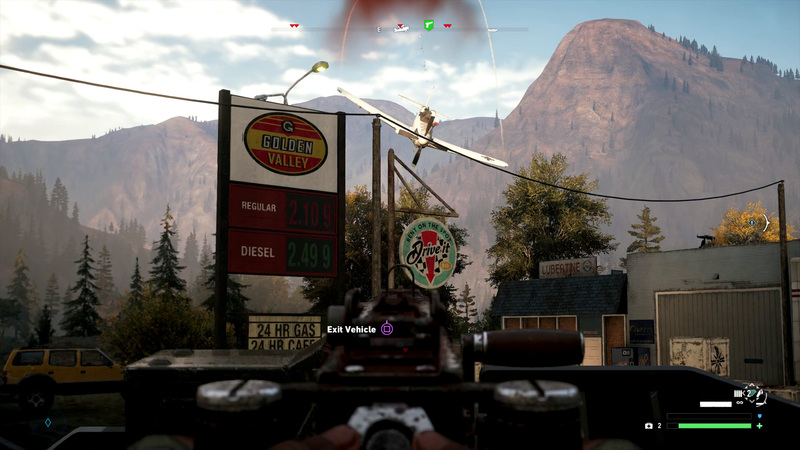 To help you get around the world, the wingsuit returns from Far Cry 3, the grappling hook is back from Far Cry 4, and Ubisoft has added helicopters and planes to the roster of available vehicles. The plane is a nice option, but having to do wide sweeps whenever I needed to turn around was a bit annoying. While you can fast-travel, once I unlocked a good helicopter, it was my preferred way of getting around. You can't discover new areas from high in the air, but it does help give you a bird's eye view of what's going on. Peaches doing what Peaches do. 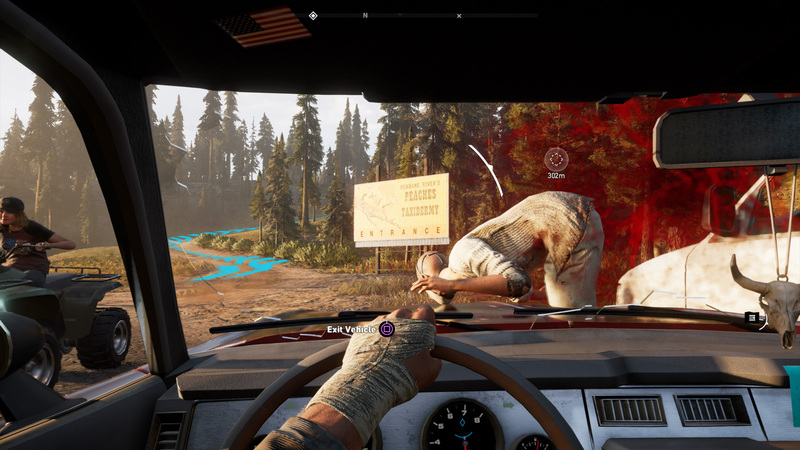 Early on in Far Cry 5, you may find that it's hard to take a breather. The main roads and waterways of the are well-patrolled by the cult when they control the region. Just wait on the road and a cult vehicle will probably come by in a minute. Out in the wilderness though, the cult is less of a presence and the wildlife isn't always in your face. 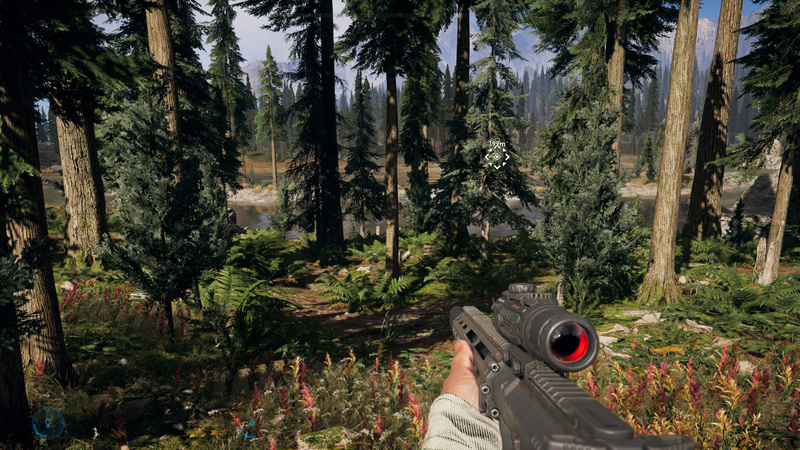 Some of the most calming parts of Far Cry 5 are just walking through the game's forests. You'll be tackling Hope County with the new rides, but you're never really alone in Far Cry 5. 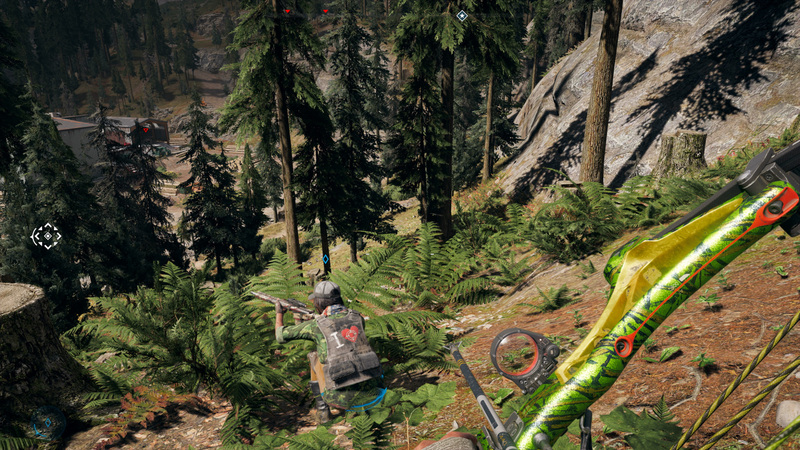 Ubisoft has expanded on the Guns for Hire system found in Far Cry 4. By liberating certain areas and freeing lone townspeople, you can hire them to be on call. They'll shoot what you tell them to, revive you in combat, and they're even pretty good at stealth kills. Beyond the random townsfolk though, there are new special Guns for Hire characters. These characters are split between the three regions, with three of the nine "named" Guns for Hire being in each region. Each one has a speciality that will come in handy. Hurk returns from previous games as an RPG-wielding vehicle killer, while Sharky Boshaw has a similar zest for life and penchant for using a flamethrower. Hurk's mother Adelaide Drubman features here too as one of the vehicle-using Guns of Hire, taking to the skies in her helicopter. Cheeseburger the bear is a pure tank, which is good because he just attacks whatever he feels like. Grace and Jess Black back me up. Once you've unlocked all of them, you'll settle into a good pair that you'll keep active most of the time. I'm stealth heavy, so I went with Jess Black, a surly, hoodie-wearing archer, and Peaches, the quiet cougar. Neither is great in a huge firefight, but they're damned good at killing quitely, provided you stay hidden. Ubisoft even went the extra mile and added a little banter between Guns for Hire; they have unique dialog depending on who you have active. You can also play the entire campaign in cooperative mode. Doing so shuts off most of the Guns for Hire system, but as a trade-off, you have another fully-functional murder machine. It's here that another change in Far Cry 5 appears: character customization. You can choose a male of female character for the silent persuasion, pick your look and then deck yourself out in a wide variety of clothes. Some you buy in shops, while others are unlocked for completing missions. In solo mode, you only see your look in Wanted posters, but cooperative allows you to see other players in all their customized glory. You can't hunt this though. While the changes to exploration are generally great, I did have a problem with the changes to crafting this time around. 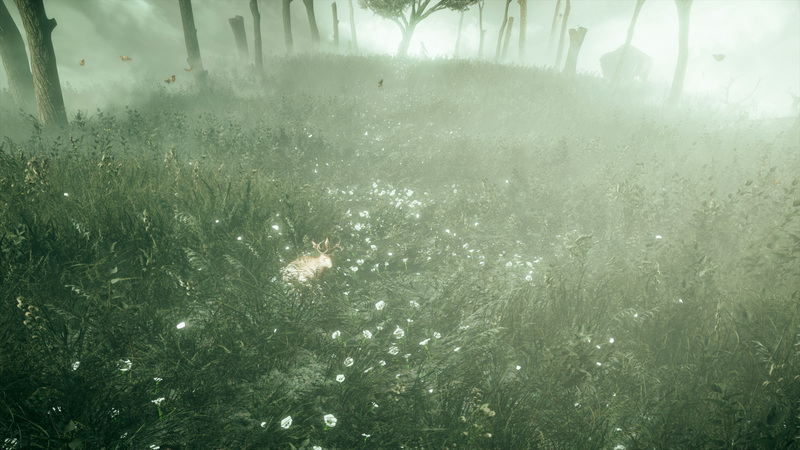 In previous games, players would hunt local animals and then use the materials to craft gear and weapon upgrades. 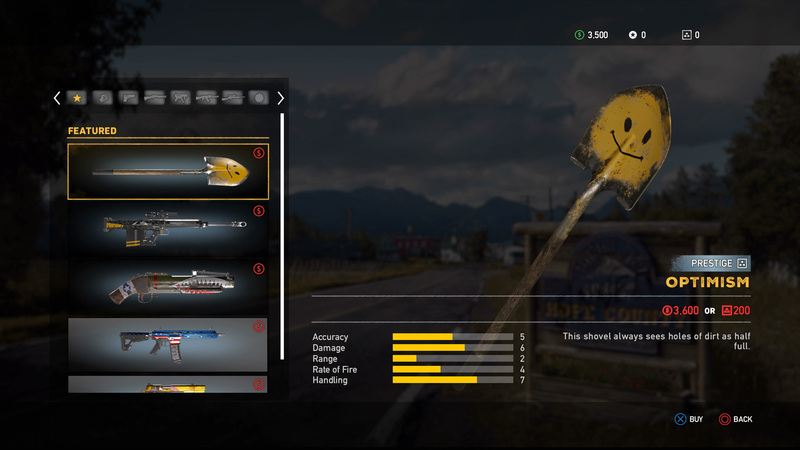 In Far Cry 5, all weapons upgrades are purchased and character upgrades are done via the new Perks skill tree. Montana has a wide variety of animals to hunt or avoid, including bears, moose, deer, or bison. There's also murderous creatures you should avoid, like the wolverine or turkey. (Seriously, turkeys are evil.) 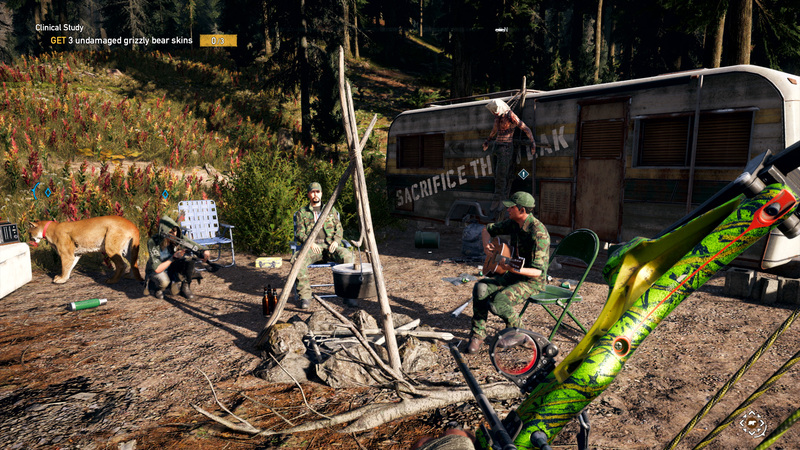 Ubisoft also added a whole new fishing system to Far Cry 5, probably spending more time on it than they needed to. Fishing in the game has its own unique mechanics, there are different rods and lures, and different fish inhabit certain bodies of water. It's pretty calming to just cast your reel out into the lake for a calm moment. I wish the hunting was as good as Far Cry Primal. The problem is there's no real reason to hunt or fish. Capturing each animal or fish a couple of times finishes off set challenges that earn you Perk Points to learn new skills. After a specific challenge is done, all the pelts and fish are just sold en masse at general stores. There's no real need to hunt once you've done a challenge. Crafting is vastly pared down compared to previous games; outside of building bombs, which is done via materials you'll find around homes. It's a shame, because tracking and hunting specific creatures was one of the highlights of Far Cry: Primal. To see it mostly left by the wayside here is a step back. The other half of most Far Cry games is a look at fictional religions and that's also on display here. Your antagonists are a vaguely Christian cult called The Project at Eden's Gate. (Known by the local populace as "Peggies".) Under the control of Joseph Seed, the Father, the cult has slowly taken over the town, converting the local populace and taking over the infrastructure. Each of the three regions in the game is under the control of one of the father's lieutenants. Holland Valley is John Seed's place, and John prefers to convert his followers through coercion and guile. The Henbane River is Faith Seed's region, full of the Bliss flowers that she turns into drugs to calm the people. The enforcer Jacob Seed controls the Whitetail Mountains, subjecting the locals with fear and his alpha pack philosophy. In each area, you'll destroy local cult structures, tear down the infrastructure used for its specific industry, and get to know the local freedom fighters through story missions. Doing so doesn't clear up areas of the map, instead it gains you Resistance Points in the area. It's here that Far Cry 5's major problem rears its head. When you reach a certain point in a region's Resistance meter, Far Cry 5 shunts you from one game to another. The narrative of Far Cry 5 is built on the cult's control of Hope County and the opening hours bleed tension and a dark tone, not unlike Resident Evil 7 or Outlast. You're an average Sheriff's Deputy tasked with arresting a local cult leader and of course, everything goes wrong. Cults are scary things that can ruin lives and Far Cry 5 trades on that fear. 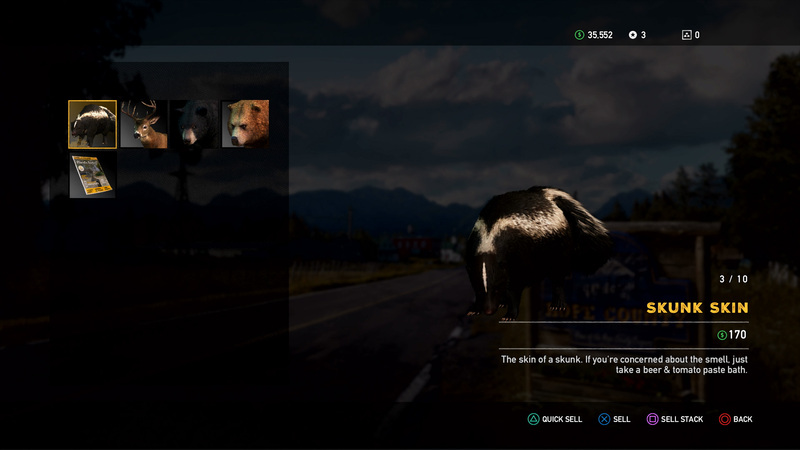 Though you don't need to ever touch it, Ubisoft has a real-money purchase system built into Far Cry 5. Every weapon, vehicle, and item of clothing costs in-game cash or Silver Bars. You can find some Silver Bars in-game, but the primary way you get them is by purchasing them with money. So, if you want to jump ahead, Ubisoft is ready for your wallet. If not, avoid it. It never popped up as a problem for me. After this prologue, the game only returns to this feeling during these Cult Leader sections. You're sent to meet with the region's leader face-to-face, where you'll get an idea of what makes them tick, sometimes ending in a mission. 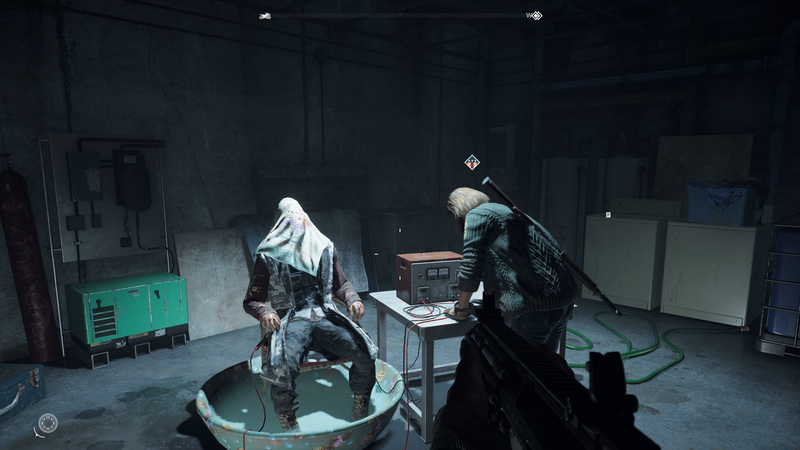 These sections carry the heavier tone of Far Cry 5's narrative, a story of people drugged, tortured, murdered, and turned against their friends. But the rest of Far Cry 5 is a playground of destruction. It's you riding around Montana, listening to great classic rock as you throw a stick of dynamite out the window. It's living up to the dream of stuntman Clutch Nixon as you race though crazy time trials. It's sniping cultists from far away as the bear mows them down and other guy lights them on fire. 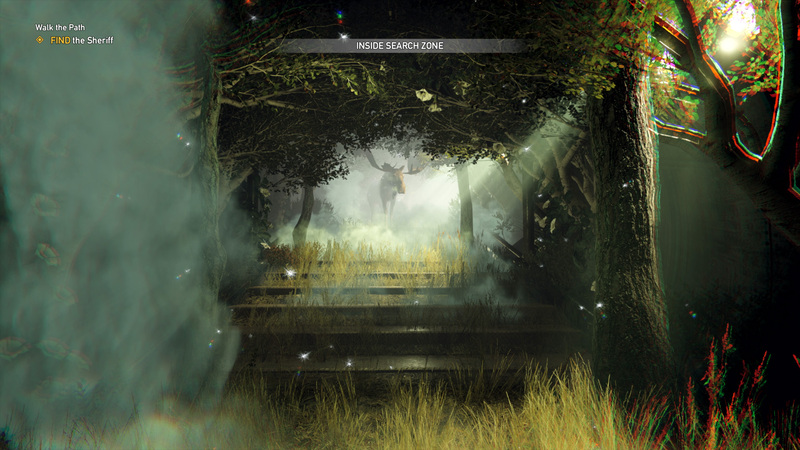 Far Cry 5 wants to be the images on the left... and the right. It doesn't quite work. One game is horror. The other is action. Occasionally, they meet, but it's an odd pairing and it's not helped by the fact that the Cult Leader missions completely stop you from doing whatever it was you were doing before. You can be working on another mission, only to pass out or get taken and wake up in one of these missions. It's a weird mechanic and I wish Ubisoft would let me choose when to switch over to these sequences. It's weird, because I enjoy both games. 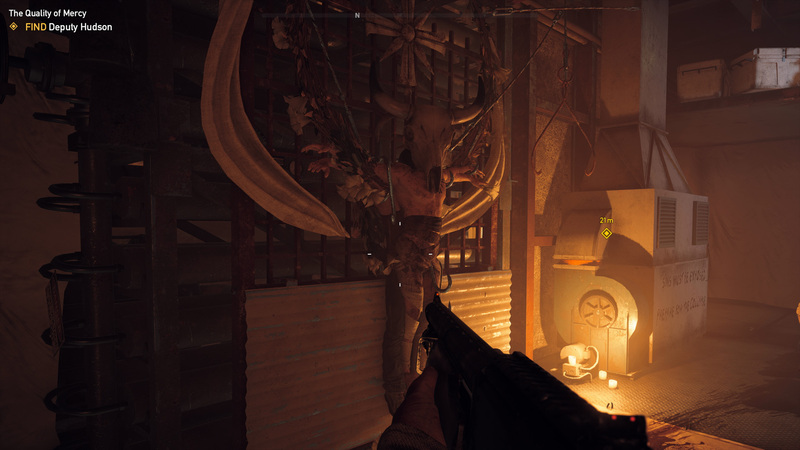 The horror side of things really does work: it's dark, interesting, very trippy at times, and Ubisoft tries to make a morality play in the style of Bioshock Infinite. (Read: I see what they're getting at even if the execution doesn't entirely work. No, shooting at the folks impaling other folks isn't bad.) And the playground is fun as hell; I actually looked forward to exploring more of Hope County and taking down more cultists with my ninja crew. But more so than other Far Cry titles, I felt like I was playing two different great games, instead of a single one. 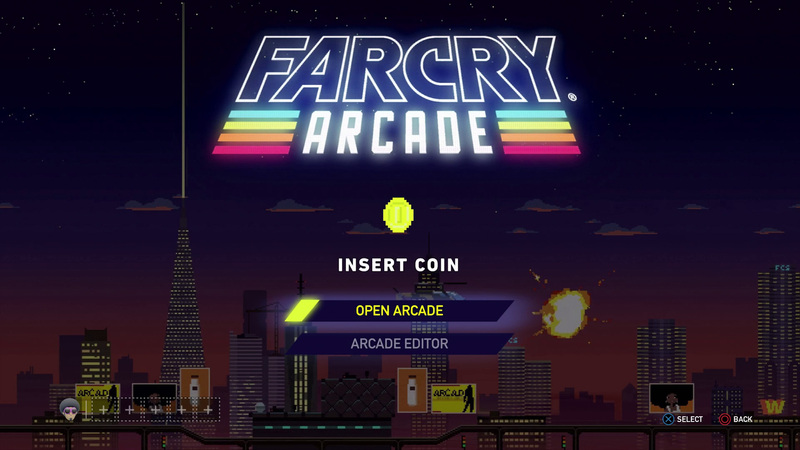 Far Cry Arcade is available from the menu, or though arcade machines and posters in the main campaign. I guess I should say three great games, because Far Cry 5 also comes with Far Cry Arcade. Arcade is the multiplayer-centric side of Far Cry, expanded into what feels like its own thing focused heavily around player-created content. You can play either solo or cooperatively through maps built for one of four gameplay modes. Journey maps have you trying to reach an exit, and sometimes even without fighting. 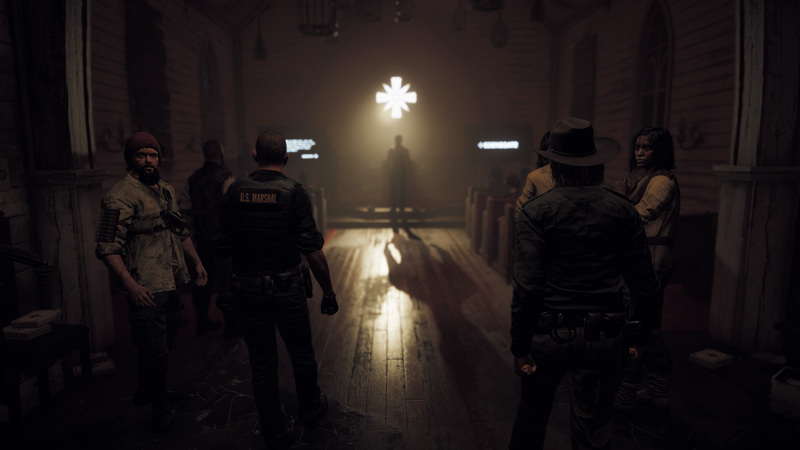 The others are more combat heavy: Assault maps charge players with killing a certain number of targets, Bounty Hunt has you killing specific targets before trying to escape, and Outpost maps work like Far Cry 5's Outposts, where you need to kill everyone within the area to clear the map. There's also full multiplayer maps, built for Deathmatch or Team Deathmatch (6v6). 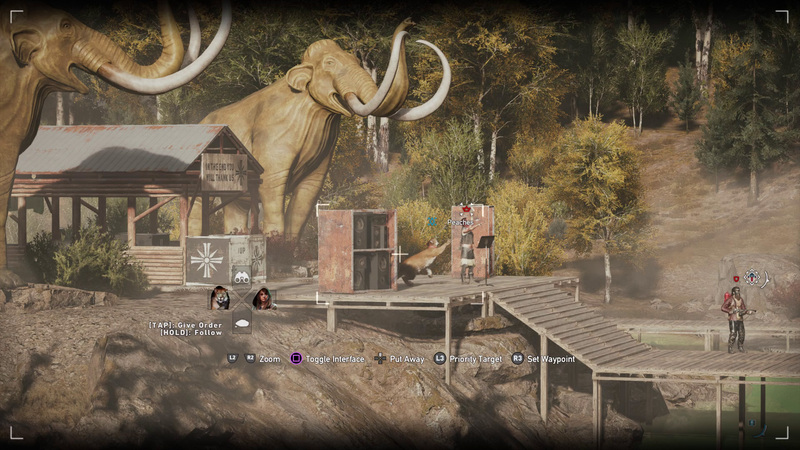 Previous Far Cry games have had a similar map editor, but what's different with Far Cry Arcade's Editor is its far more robust. For one, Ubisoft has loaded it up with pre-made characters, objects, and structures from Far Cry 5, Far Cry 4, Far Cry Primal, Watch Dogs, Assassin's Creed: Black Flag, and Assassin's Creed: Unity. 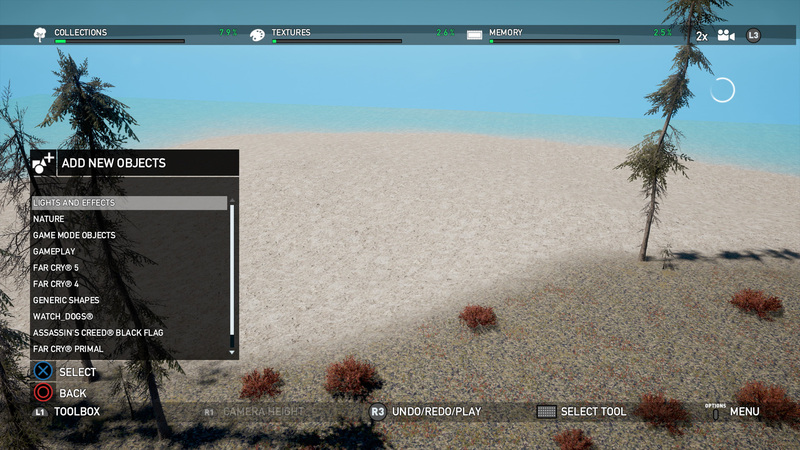 Beyond that though, the Editor offers a wide variety of terrain, effects, gameplay modifiers, and more. You can change the sky box, the weather, set up the AI, add audio and environmental effect; it honestly feels like Ubisoft is trying to built the biggest map editor yet. 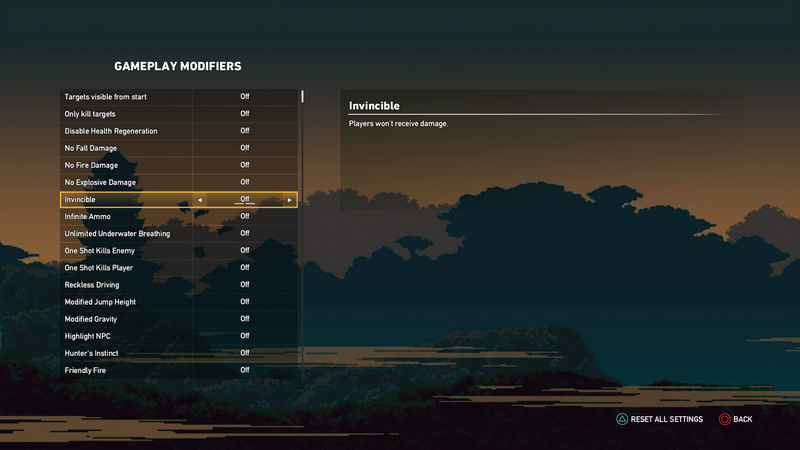 You can play through user created maps in Far Cry Arcade using your campaign character. Finishing maps (or even just playing them) nets you experience, which gives you Perk Points and money when you level. You use the same character in campaign or Arcade, with skills carrying through on either mode. 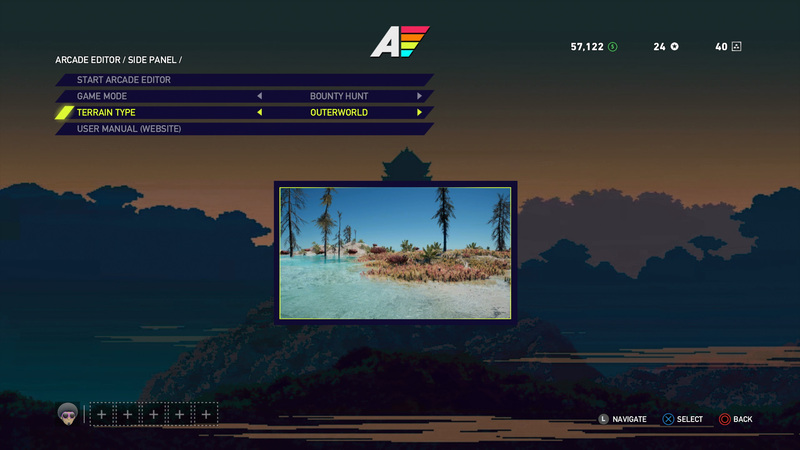 You can also play Arcade Hero mode, which throws you at random new maps for double experience gain as a way to get players to rate new content. I admit the Deathmatch feels a bit janky in some of the maps currently available and matchmaking takes forever, but the Solo/Coop experiences show a lot of promise. 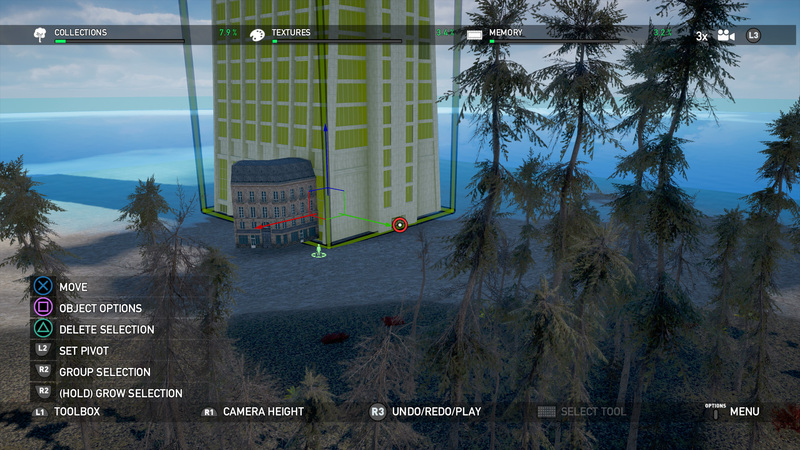 One Ubisoft map has you clearing an outpost on top of buildings in a sunken city. A good Bounty Hunt map had me sneaking through a prison to get to my target, starting with only a single throwing knife. There's a lot of great stuff that can happen in Far Cry Arcade if you're willing to open yourself to it. I even tried the Map Editor, but I had Minecraft Syndrome: big dreams, but no desire to put in the time to build those dreams. Far Cry 5 has feelings to give... maybe. I have problems with Far Cry 5. The fighting tones of the game's narrative and the rest of the game world is a problem, and Ubisoft's method of pushing you between them isn't great. I wish crafting and hunting were more meaningful. At the end of the day though, I had a great time with Far Cry 5. Montana might be my favorite setting outside of Primal's Oros, as it provides just enough differentiation to keep the experience novel, while not being as annoying to get around as Far Cry 4 was. I was on the ride for most of the game (right up until that ending, which I'll write about in another article), and I can't always say the same for other Far Cry titles. It's one of the best in the modern version of the series and that's before you take into account Far Cry Arcade. Great job all around Ubisoft. 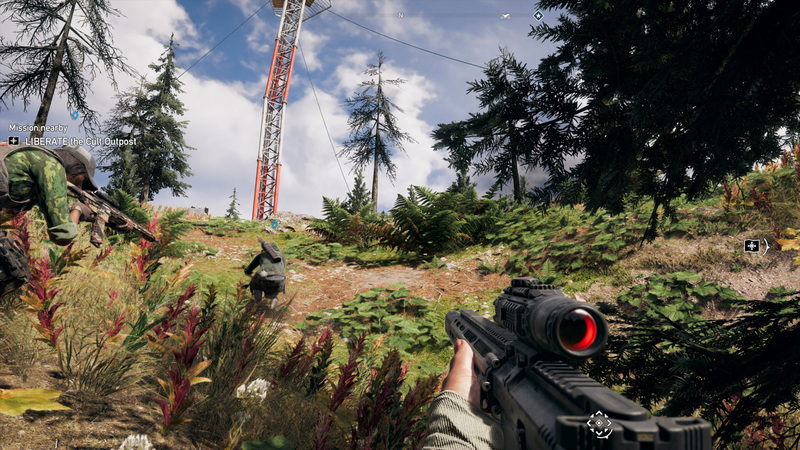 Far Cry 5 is a game that struggles in trying to serve two purposes. On one hand, there's a dark, horrific tale of a cult taking over a small town. On the other, it's a playground of destruction, letting players fly and drive around, blowing up things with a bear and a dog. Both sides are good, but they don't really meet in the middle. If you can survive the tonal whiplash, you'll find a great game here and Far Cry Arcade only makes it better. Tagged with Action,	PC,	PlayStation 4,	Reviews,	Ubisoft,	Xbox One. Celebrate the Year of The Pig.